Perhaps every blogger's desire is to have many people viewing his/her website. It really takes a lot of hardwork and research to be able to post entries and articles and attract readers to come back and follow what you are saying in your blog. And so for this, I am offering my congratulations to my co-blogger Tina for achieving 1 million+++ visits (and counting!). 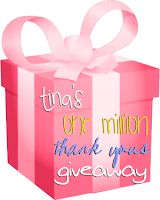 To celebrate the occassion, Tina is giving away some exciting giveaways to all of us. 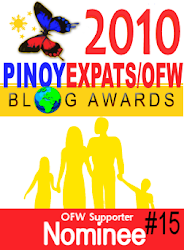 Here's the (very easy mechanics)- blog about her one million thank yous giveaway promo, and leave the url of your blog on her comments box. 1st prize - $15.00 and 3 months of free advertising! 2nd prize- $10.00 and 2 months of free advertising! 3rd prize- $5.00 and 1 month of free advertising! Again, a million congratulations to Tina for that 1million+++ views!